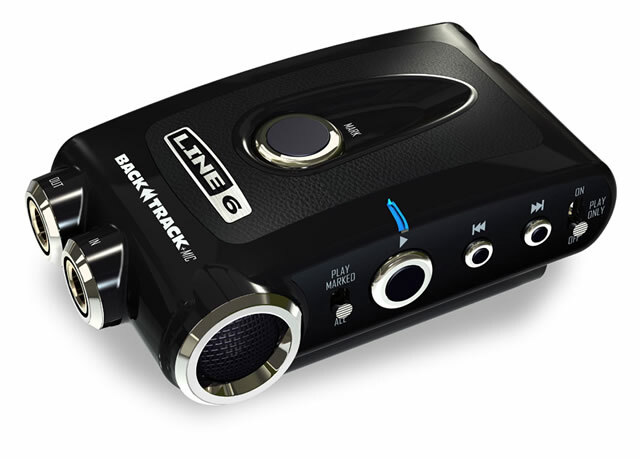 Just in the nick of time for Christmas, if you haven’t already been sensible and grabbed your special someone (yourself) a gift, we’ve got hold of a Line6 Pocket POD Express and BackTrack+mic to give you the low-down on these cute little gadgets. We’re currently working on a full review, but first impressions are good. 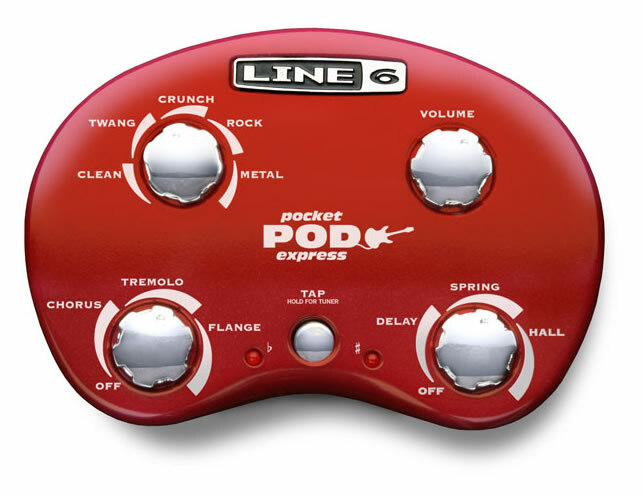 The Pocket POD Express is a cut down version of Line6’s full sized guitar effects pods and is capable of running on batteries. It’s not quite pocket sized (unless you’re the cargo wearing type) but is easy to slip into a gig bag. In the typical Line6 style it looks cracking good, with a fluid organic look and low profile metal knobs for operating its key functionality. If the 5 guitar tones and 6 effects aren’t enough, it will also double as a guitar tuner and boasts a line input for an mp3 player or other audio source that you want to jam along to- obviously that’s only any use when you’re wearing a pair of cans, but is great for both amateur and professional musicians. The BackTrack +mic is a brilliant addition to a Guitar + Pocket POD setup. Letting you record 4 hours of album quality (24-bit/48 kHz) audio straight to WAV on its internal flash memory and up to 24 hours of audio at decreasing levels of quality. It’s a very, very light and compact pocket recorder for something that incorporates a rechargeable battery, microphone, quarter inch in/out, a 3.5mm headphone jack with volume control and a belt clip. The battery is completely integrated and charged by USB and desktop software provides a UI for setting up the BackTrack’s clock and other settings. Buttons on the top and side of the backtrack allow for instant replay in addition to a “mark” button you can use to isolate a sound clip when you nail a riff. If you’re buying for a guitar-playing other half, then either one, the other or a combination of both is bound to be affordable! You can in a pinch get the microphone free BackTrack with a 2 to 12 hour recording time for just under Â£63 but its lack of Microphone isn’t terribly acoustic-guitar or vocalist friendly. This entry was posted on Thursday, December 18th, 2008 and is filed under News, Professional Audio.